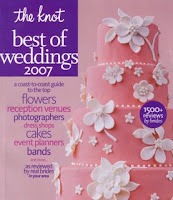 This week The Knot Best of Weddings 2007 inaugural issue hits news stands! This is must read if you are planning a wedding. It lists the top wedding professionals across the country, divided by location and speciality. Brides voted on who they thought was the best. I am thrilled because Elegant Engagements Wedding Planners was picked Best Of for event planners. Thank you to all the clients that voted and thank you to all wedding professionals, family and friends for your continued support.